“Setting oneself up to receive luck is important,” says Soles. “My luck was that my biochemistry professor [at Texas A&M] set me up to work in Switzerland one college summer vacation for his cousin, Hans Uli Kesslering, who grew Pinot Noir and was a pioneer in sustainable agriculture in the mid-’70s.” Soles credits this experience as the impetus to his future in wine. A side note: “Can’t get any tougher than ripening Pinot Noir in northern Switzerland,” he confirms. In 2001, Soles and his wife, Corby, planted vines on land they purchased in 1987 within the Chehalem Mountains AVA. From that vineyard, Wits’ End, Soles produced his own “Private Stash” Pinot Noir, a cult wine later served at the White House. Such success paved the way in 2009 for Soles to establish ROCO Winery — the name derives from the first two letters in Rollin and Corby — and build a tasting room in 2012. 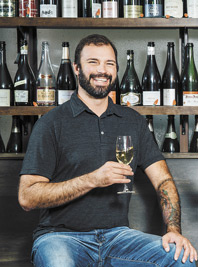 In 2013, Soles turned over the Argyle reins to winemaker Nate Klosterman to concentrate on ROCO. Klosterman has since added Ksenija Kostic House as Argyle’s assistant winemaker — Soles still maintains a healthy mentoring relationship with Argyle. While Soles laid the foundation, many people point to Andrew Davis, founder of The Radiant Sparkling Wine Company, for Oregon’s dominance in sparkling today. As Argyle grew, Davis realized he wanted to take on a personal project of a much smaller scale. That day arrived in 2013. 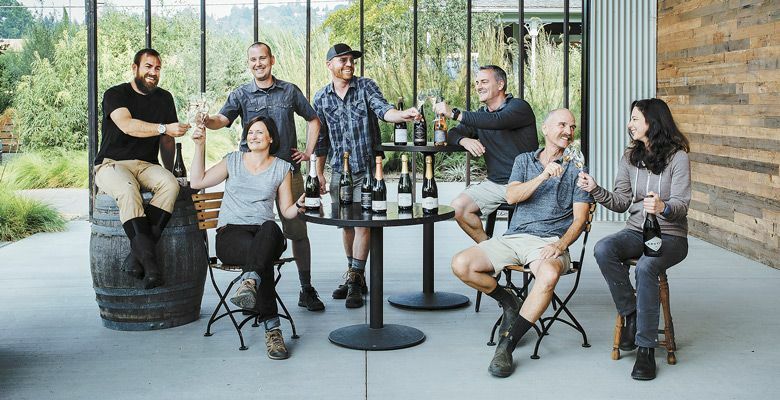 Sensing a latent desire from area winemakers for assistance starting their own sparkling projects, Davis founded Radiant — partially funded by Rollin and Corby Soles. 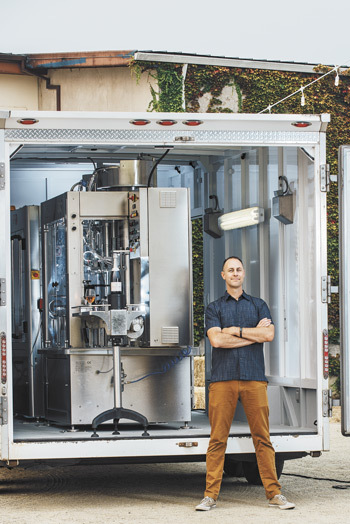 Investing in a state-of-the-art mobile bottling unit, coupled with a no-frills warehouse operation replete with a gyropalette for riddling and an assembly unit for disgorging, topping, corking, caging and labeling, Radiant provides Oregon winemakers the sparkling infrastructure without the costly capital outlay. “This is coming up on year six of the Radiant Sparkling Wine Project,” says Davis. “I started with a number of people thrown together very quickly in 2013. That doubled the next year, and then doubled again.” He reveals he’s somewhat surpassed his goal regarding clientele, with future success measured in other ways. Not wanting to give up his winemaker’s hat, Davis, in 2013, also participated in a collaboration called Lytle-Barnett with Andy Lytle, Antony Beck and consulting winemaker Pieter “Bubbles” Ferreira of Graham Beck. Davis found the fruit, made the base wine, and bottled the blanc de noirs, brut and brut rosé, all pending release. Radiant impacts a number of Oregon sparkling wine projects, including Chemeketa Community College Wine Studies Program. The Willamette Valley college first integrated sparkling wine production into their curriculum two years ago. (tier-ahhj) Second fermentation in the bottle after the addition of yeast, nutrients for the yeast and sugar. Act of removing the frozen plug of ice (containing spent yeast) from a bottle of sparkling wine after riddling. Disgorging takes place on a bottling line just prior to adding dosage and the final corking of the finished bottle. 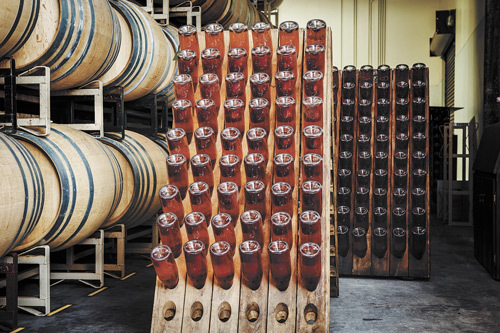 The few ounces of wine, sometimes sweetened, that is added to each bottle of sparkling after disgorging to make up for the liquid volume lost by disgorging. The gradual tilting of the bottle neck-down (sur pointe), meanwhile rotating it by small increments, clockwise and counter-clockwise. As the angle of tilt increases, the forces of gravity draw the sediment into the neck. Champagne or sparkling wine made exclusively from white grapes, which almost always means 100-percent Chardonnay. Champagne or sparkling wine made from red grapes. It can be 100-percent Pinot Noir, 100-percent Pinot Meunier or a blend of the two. For some, méthode Champenoise constitutes a means of self — and site — expression. 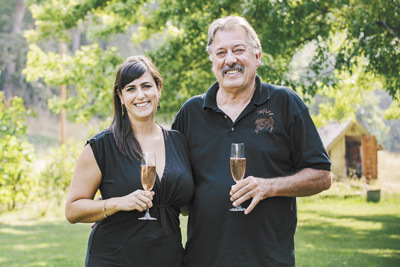 Anne Amie Vineyards winemaker Thomas Houseman always wanted to make sparkling wine but held back due to associated costs and logistical hurdles. However, he believed that Anne Amie’s 12 Oaks Estate on Chehalem Mountain, a cool vineyard with great acidity, presented the perfect site for bubbles. 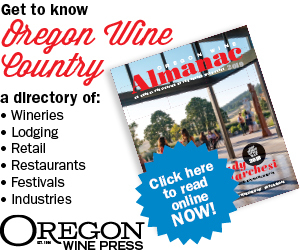 Since 2015, Anne Amie has hosted Bubbles Fest, a two-day consumer event held every February centered on Oregon sparkling wine. In 2018, the winery added a technical symposium for sparkling producers. “The idea is to do for sparkling wine what the Steamboat Pinot Noir Conference did for Pinot Noir, giving us a forum to share our trials, our successes and our failures,” explains Houseman. Frey produces four different sparkling wines under the Pashey label, an homage to his maternal grandmother, a striking, dark-haired British ‘traveler,’ or gypsy, whose image graces the muselet atop every bottle. 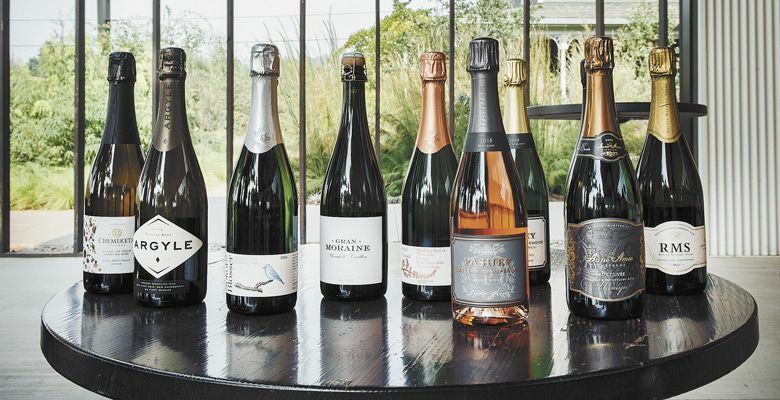 The sparkling wine industry favors those flirting beyond the traditional fizz framework, too. 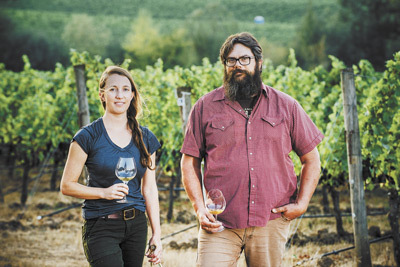 While growing in popularity, Oregon Pét Nat producers like Dan Rinke of Johan Vineyards in Rickreall and Kate Norris of Division Wine Company in Portland, still remain a select tribe. Sometimes confused with its famous concert-going cousin, The Gorge in eastern Washington, Oregon’s Columbia Gorge AVA scrims both sides of the Columbia River with wind-swept, hard-scrabble, moody drama. Scoured, uplifted and layered by epoch-old geologic events, it turns out this vertiginous fulcrum between the Willamette and Columbia valleys proves an ideal crucible for making some of Oregon’s most compelling bubbles. 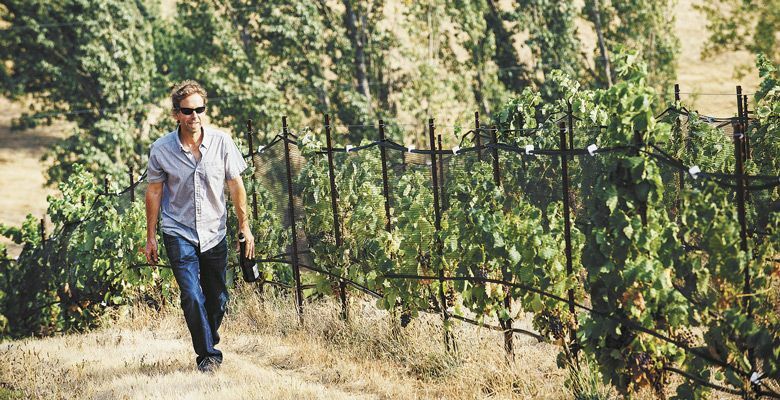 Part of this region’s success rests on the unassuming shoulders of vineyard manager and winery owner Lonnie Wright, and his dynamic daughter Sierra Wright of The Pines 1852 in The Dalles. Lonnie Wright moved to the Columbia Gorge in 1981 after marrying a local girl. Fresh from a three-year stint planting vines for Columbia Crest in Patterson, Washington, Wright immediately found work helping restore what proved to be one of Oregon’s oldest vineyards, The Pines, a site planted in the 1890s to old-vine Zinfandel. Over time, he developed a successful vineyard management company while leasing, expanding and, eventually, purchasing The Pines. Convinced of the region’s potential, as well as the quality of their fruit, the Wrights established The Pines 1852 winery in 2001. In 2005, the Columbia Gorge AVA was approved. That same year, Sierra returned from college to assist, and The Pines 1852 built the first tasting room in downtown Hood River. Finally, in 2009, after much prodding, Sierra convinced her father to venture into sparkling wine. A pragmatic man, the decision wasn’t easy. Wright initially contracted with Chris Berg of Roots Wine Company for their 2009 and 2010 vintages but logistical issues with the bottler led them to Radiant Sparkling Wine Company in 2012; the mobile bottler also completed their 2016 vintage. The 2016 is still on tirage. Ultimately, sparkling wine chooses the winemaker. Analemma Wines winemaker Steven Thompson and partner Kris Fade moved to Mosier from Walla Walla, Washington, in 2010. Veterans of tending Bordeaux varietals and Syrah from The Rocks District of Milton Freewater within the context of “normal” growing cycles, their first vintage in the Columbia Gorge proved anything but usual. Instead of panicking, the two listened patiently, and learned. They discovered Atavus Vineyard, the 50-year-old site they leased and managed above White Salmon, Washington, contained the Mariafeld clone from Switzerland, a Pinot Noir suited to cold climates. They also realized making sparkling wine was the original vision of the vineyard’s founder, Charles Henderson. 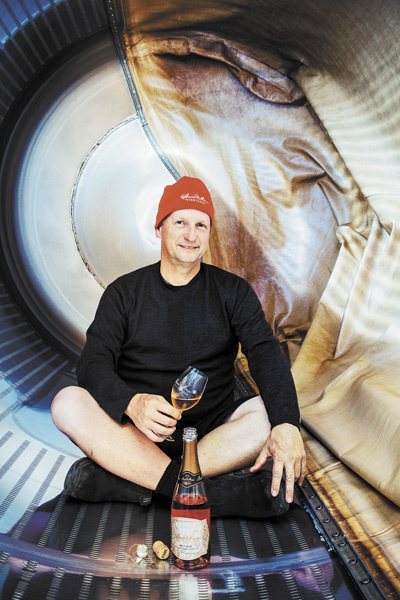 The slight, soft-spoken Thompson imbues a meditative approach to each aspect of sparkling wine production, save riddling and disgorgement, which he entrusts to The Radiant Sparkling Wine Company. Translucent golden hue with persistent perling and rich, cashmere-like mousse that unlocks subtle, intoxicating aromas of marzipan, brioche and almond blossom. Well-poised acidity, incisive minerality,and complex layers of citrus, yellow apple and red fruit unfurl seamlessly upon the palate, culminating in a luxurious, effortless finish. Vibrantly beaded salmon robe reveals refined aromas of rose petal, red apple and wild strawberry. Tight acids amplify plush pomegranate, raspberry and savory notes that pulse to a fleshy finish. An effervescent, light-bodied beauty with lingering minerality. This pale straw-colored cuvée with scintillating beads and rich, rounded mousse offers abundant aromas of brioche, almond paste and lemon zest. Shimmery, petite perling and profuse mousse enliven clean citrus and rich biscuit aromas, carrying through on the palate to subtle notes of lemon curd, golden apple and fleurs blanches that echo in the finish. Soft, straw-robed sparkler awash with dark fruit and sultry spice box aromas that break into a densely textured delight. Bright acids and luscious notes of red plum and citrus serve up a seamless finish. Soft rose petal hue punctuated by pinpointed perling and discrete aromas of salmonberry, roses and brioche. Flavors of gooseberry, red raspberry, green apple and citrus lilt to an ethereal finish. Impeccably structured and well-balanced. Channeling Côte de Blancs. Pale straw robe, precise perling and diaphanous mousse. Heady aromas of brioche, butterscotch, marzipan and lemon flower. On the palate, a graceful composition of chalky, chiseled brilliance with hints of lemon zest and brief herbal back note, punctuated by a taut minerality and crisp finish. Elegant pale gold robe, vibrant beading and ethereal mousse with keffir lime, almond blossom and Meyer lemon aromas. Well-structured, angular, lean on the palate with flavors of grapefruit and green apple, and a remarkable finesse that carries through start to finish. (100-percent Syrah) Light copper robe alight with dispersed, prolific beading and voluptuous mousse. Elegant acids and aromas of pear, toasted bread and red fruit follow through to an enticing finish. A fun, flirty wine with pale straw robe, dispersed beading and hints of toast, golden apple and lychee on the nose. Broad, sunny flavors of Meyer lemon, grapefruit and Comice pear on the palate with a luminous finish. Bluebird Cuvée’s sophisticated, elegant older sister. Myriad trigger points release a plethora of tiny bubbles throughout a burnished copper-rose robe cresting to a creamy mousse. Seductive aromas of rose, toast and red fruit carry through on the palate to red cherry, tart apple, pink grapefruit flavors, followed by a faint umami note on the beguiling finish. A single column of tightly coiled bubbles bursts to the pale lemon surface in a glittery swirl, releasing aromas of warm toast, citrus and almond flower. On the palate, firm acids and delicate flavors of quince, grapefruit and brioche flirt to an elegant finish. Clear gold robe, diffuse mousse, pinpoint perling coupled with opulent brioche, toast, butterscotch, faint almond paste aromas. A cornucopia of posh quince, ripe pear and lemon flavors spill forth with lusty abandon to an earthy, herbaceous finish. Soul-sender. Sheer gold robe, centralized beading, creamy mousse and toasty, nutty aromas. Exotic flavors of marzipan, lemon curd and ambered butterscotch tether to keen acids for a brilliant finish. Dazzling strawberry robe illuminated by a riot of elusive bubbles explodes with toast, fresh strawberry and Royal Anne cherry aromas. On the palate, tart red cherry, lemon zest and stony minerality complement a firm minerality, pronounced acids and meticulous finish. Dusty copper robe fizzes with high intensity beads charged with raspberry, brioche and stone fruit aromas. Exotic flavors of fleshy orange fruits, Fuji apple and sour cherry juxtapose against restrained acids to a chalky, mineral finish. Melon de Bourgogne in the house! Burled gold robe, frothy mousse and potent baked apple, cider, yeast aromas. Well-balanced, light-bodied with flavors of Gala apple, Bosc pear and lemon curd on the palate. Glorious apricot robe, pinhead perling, generous mousse and aromas of zwieback, marmalade and Melba toast. On the palate, flavors of Mandarin orange, tart raspberry, and pamplemousse pair with even-keeled acids for a straightforward finish. Young spirit. Old soul. Plentiful trigger points infuse the pale, gold robe with infinitesimal bubbles radiant with aromas of rusk, brioche and fleurs blanches. Snappy acids tease out flavors of Bartlett pear, kaffir lime, lemon and ambrosia apple, fading to a subtle finish. Venetian gold robe, ultra-fine beading, lustrous mousse, lavish viennoiseries aromas, light body, vivid acids, with notes of Jonagold apple, Eureka lemon on the palate and a fresh finish. Dusky copper robe, energizing shafts of small bubbles, with appealing aromas of sage, rose and chocolate croissant. Wind-tossed wild raspberry, Rainier cherry, Meyer lemon flavors on the palate, with a satisfying, slightly savory finish. A kinetic, coral-copper robe pulsing with minute beading, embellished by a gossamer mousse. Alluring aromas of citrus, stone fruit and brioche on the nose, followed by a soupçon of woodland strawberry, Royal Anne cherry and Granny Smith apple flavors on the palate. Flawless structure, pristine acids, impeccable finish.